Pompidou was born in the commune of Montboudif, in the department of Cantal in central France. After his khâgne at Lycée Louis-le-Grand, where he befriended future Senegalese poet and statesman Léopold Sédar Senghor, he attended the École Normale Supérieure, from which he graduated with a degree of agrégation in literature. He first taught literature at the lycée Henri IV in Paris until hired in 1953 by Guy de Rothschild to work at Rothschild. In 1956, he was appointed the bank's general manager, a position he held until 1962. Later, he was hired by Charles de Gaulle to manage the Anne de Gaulle Foundation for Down syndrome (de Gaulle's daughter Anne had Down's syndrome). The man gave the appearance of being secretive, wily, a little cunning – which he was, to a degree. However, it was primarily his intelligence, culture, and competence that conferred indisputable authority on him and commanded respect.... I remember his untamed eyebrows, his penetrating, very kindly gaze, his perceptive smile, full of humour and mischievousness, his voice with its wonderful low, warm, gravelly tone, and a figure that was both powerful and elegant. Naturally reserved, little given to emotional outbursts, Pompidou did not forge very close ties with his colleagues. He served as prime minister of France under de Gaulle after Michel Debré resigned, from 14 April 1962 to 10 July 1968, and to this day is the longest serving French prime minister under the Fifth Republic. His nomination was controversial because he was not a member of the National Assembly. 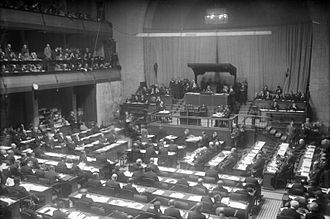 In October 1962, he was defeated in a vote of no-confidence, but de Gaulle dissolved the National Assembly. 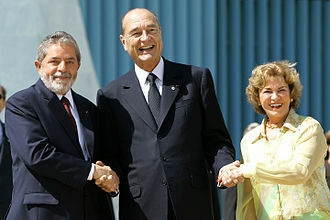 The Gaullists won the legislative election and Pompidou was reappointed as Prime Minister. In 1964, he was faced with a miners' strike. He led the 1967 legislative campaign of the Union of Democrats for the Fifth Republic to a narrow victory. 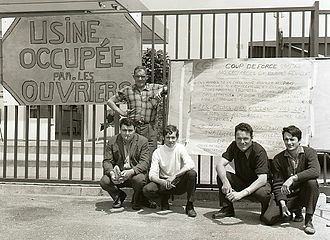 Pompidou was widely regarded as being responsible for the peaceful resolution of the student uprising of May 1968. His strategy was to break the coalition of students and workers by negotiating with the trade-unions and employers (Grenelle conference). Until this crisis, he was the Prime Minister of a quiet and prosperous France. However, during the events of May 1968, disagreements arose between Pompidou and de Gaulle. Pompidou did not understand why the President did not inform him of his departure to Baden-Baden on May 29. Their relationship, until then very good, would be strained from then on. Pompidou led and won the 1968 legislative campaign, overseeing a tremendous victory of the Gaullist Party. He then resigned. Nevertheless, in part due to his actions during the May 1968 crisis, he appeared as the natural successor to de Gaulle. Pompidou announced his candidature for the Presidency in January 1969. Some weeks later, his wife's name was mentioned in the Markovic affair, thus appearing to confirm her husband's status as a cuckold. Pompidou was certain that de Gaulle's inner circle was responsible for this smear. In social policy, Pompidou's tenure as prime minister witnessed the establishment of the National Employment Fund in 1963 to counter the negative effects on employment caused by industrial restructuring. 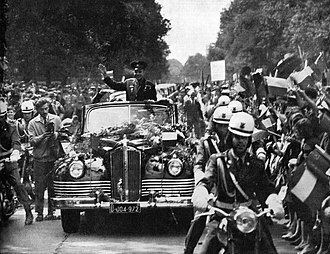 After the failure of the 1969 constitutional referendum, de Gaulle resigned and Pompidou was elected president of France. In the general election of 15 June 1969, he defeated the centrist President of the Senate and Acting President Alain Poher by a wide margin (57%–42%). Though a Gaullist, Pompidou was more pragmatic than de Gaulle, notably facilitating the accession of the United Kingdom to the European Community on 1 January 1973. He embarked on an industrialisation plan and initiated the Arianespace project, as well as the TGV project, and furthered the French civilian nuclear programme. He was sceptical about the "New Society" programme of his prime minister, Jacques Chaban-Delmas. In 1972, he replaced Chaban-Delmas with Pierre Messmer, a more conservative Gaullist. While the left-wing opposition organised itself and proposed a Common Programme before the 1973 legislative election, Pompidou widened his presidential majority by including Centrist pro-European parties. In addition, he paid special attention to regional and local needs in order to strengthen his political party, the UDR (Union des Democrates pour la Ve République), which he made it a central and lasting force in the Gaullist movement. The United States was eager to restore positive relations with France after de Gaulle's departure from office. New US President Richard Nixon and his top adviser Henry Kissinger admired Pompidou; the politicians were in agreement on most major policy issues. The United States offered to help the French nuclear programme. Economic difficulties, however, arose following the Nixon Shock and the 1973-75 recession, particularly over the role of the American dollar as the medium for world trade. 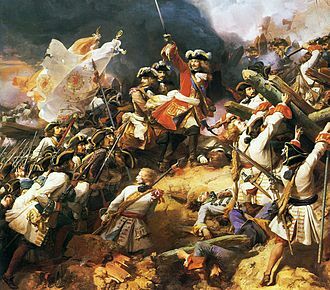 Pompidou sought to maintain good relations with the newly-independent former French colonies in Africa. In 1971, he visited Mauritania, Senegal, Ivory Coast, Cameroons, and Gabon. He brought a message of cooperation and financial assistance, but without the traditional paternalism. 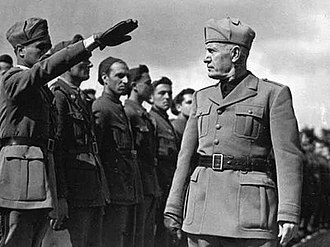 More broadly, he made an effort to foster closer relations with North African and Middle Eastern countries in order to develop a hinterland including all nations bordering the Mediterranean. Pompidou's time in office was marked by constant efforts to modernise France's capital city. He spearheaded construction of a modern art museum, the Centre Beaubourg (renamed Centre Pompidou after his death), on the edge of the Marais area of Paris. Other attempts at modernisation included tearing down the open air markets at Les Halles and replacing them with the shopping mall of the same name, building the Montparnasse Tower, and constructing an expressway on the right bank of the Seine. 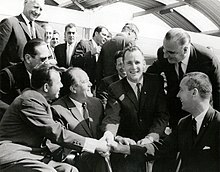 Pompidou with U.S. president Richard Nixon in Reykjavík, 31 May 1973. Pompidou with West German chancellor Willy Brandt in Cologne, 3 July 1972. While still in office, Pompidou died on 2 April 1974, 9 PM, while in his apartment, from Waldenström's macroglobulinemia. 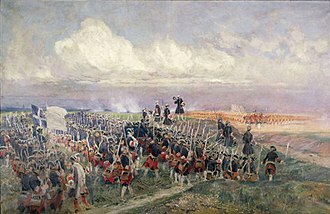 His body was buried on the 4th of April, in the churchyard of Orvilliers, where he'd bought an old baker's house and turned it into a weekend home. The official memorial service was held at Notre-Dame de Paris with guests including US President Richard Nixon, British Prime Minister Edward Heath and West German Chancellor Willy Brandt, King Hassan II of Morocco, Tunisian President Habib Bourguiba and Rainier III, Prince of Monaco. Pompidou's wife Claude Pompidou would outlive him by more than thirty years. The couple had one (adopted) son, Alain Pompidou, who went on to serve as president of the European Patent Office. France withdrew from the Eurovision Song Contest 1974, which took place just four days after Pompidou's death, as a mark of respect. 22 February 1965 – Gaston Palewski leaves the ministry and is not replaced. Wikimedia Commons has media related to Georges Pompidou. ^ Wall, E. H. (1976). "Pompidou, Georges Jean Raymond". In William D. Halsey. Collier's Encyclopedia. 19. Macmillan Educational Corporation. p. 236. ^ Kresl, Peter Karl; Gallais, Sylvain (1 January 2002). "France Encounters Globalization". Edward Elgar Publishing. Retrieved 14 September 2018 – via Google Books. ^ Berstein, Serge; Rioux, Jean-Pierre (2000). The Cambridge History of Modern France: The Pompidou Years, 1969–1974. Cambridge University Press. pp. 14–15. ^ Edward A. Kolodziej, French Foreign Policy under de Gaulle and Pompidou: The Politics of Grandeur (1974). ^ Robertson, Nan (3 April 1974). "President Pompidou Dead after almost Five Years as De Gaulle's Successor". The New York Times. Retrieved 3 April 2019. ^ Kamm, Henry (5 April 1974). 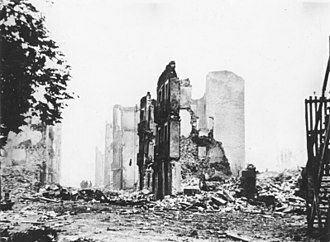 "Pompidou is Buried in Village Cemetery". The New York Times. Retrieved 3 April 2019. ^ "Georges Pompidou Notre Dame Pictures and Images". Getty Images. 5 April 1974. Retrieved 3 April 2019. ^ a b "Claude Pompidou". The Daily Telegraph. 5 July 2007. Retrieved 3 April 2019. Bell, David. Presidential Power in Fifth Republic France (2000) pp 105-26. Berstein, Serge; Jean-Pierre Rioux (2000). The Pompidou Years, 1969-1974. Cambridge UP. Hibbs, Douglas A.; Vasilatos, Nicholas (1981). Economics and Politics in France: Economic Performance and Mass Political Support for Presidents Pompidou and Giscard d'Estaing (PDF). European Journal of Political Research. vol.9#2. pp. 133–145. 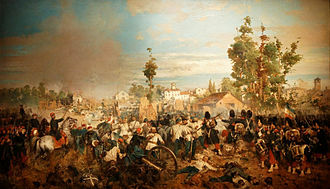 Kolodziej, Edward A. (1974). French international policy under de Gaulle and Pompidou: the politics of grandeur. Cornell Univ Press. Lauber, Volkmar (1983). The political economy of France: from Pompidou to Mitterrand. Trachtenberg, Marc (2011). The French Factor in US Foreign Policy during the Nixon-Pompidou Period, 1969–1974 (PDF). Journal of Cold War Studies. 13. pp. 4–59. Baron Guy Édouard Alphonse Paul de Rothschild was a French banker and member of the Rothschild family. He owned the bank Rothschild Frères from 1967 to 1979, when it was nationalized by the French government and he was named to the International Best Dressed List Hall of Fame in 1985. Baron Guy de Rothschild was born in Paris, the son of Baron Édouard de Rothschild and his wife, guys elder brother, Édouard Alphonse Émile Lionel, died at the age of four of appendicitis, he had two younger sisters and Bethsabée. Half of his great-grandparents were Rothschilds and he was a great-great grandson of the German patriarch of the Rothschild family Mayer Amschel Rothschild, who founded the familys banking in the 18th century in Frankfurt, Germany. He grew up at his parents townhouse on the corner of the rue de Rivoli and he was educated at the Lycée Condorcet and Lycée Louis-le-Grand in Paris, and by private tutors. He undertook military service with the cavalry at Saumur, and played golf for France and he won the Grand Prix de Sud-Ouest in 1948. Guy de Rothschild married twice, In 1937, he married a distant cousin, Alix was the former wife of Kurt Krahmer and the younger daughter of Baron Philipp Schey von Koromla, the first Hungarian Jew to be made an Austrian noble. They had one child, David René de Rothschild, Rothschild raised his wifes daughters from her prior marriage to Krahmer and Bettina. In 1957, he married Baroness Marie-Hélène van Zuylen van Nyevelt, marie-Hélènes first marriage to Count François de Nicolay—with whom she had one son, Philippe de Nicolay—had been dissolved in 1956. Like his first wife, she was a distant cousin, though in this case and they had one child, Baron Édouard de Rothschild. After his second marriage, Guy de Rothschild renovated the Château de Ferrières, using it to put on lavish balls in the early 1970s, the same year, he bought the Hôtel Lambert on the Île Saint-Louis in Paris, the top floors of which became his Paris residence. In 1940, as a result of the German occupation of France in World War II, Guy de Rothschilds parents and sister Bethsabée fled France and made their way to safety in New York City. 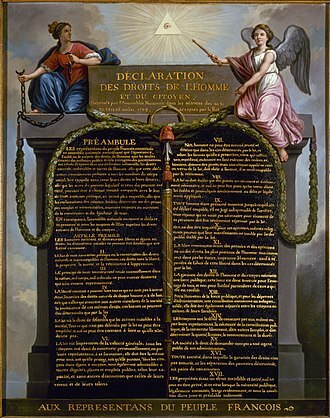 The 1789 Declaration of the Rights of Man and of the Citizen. 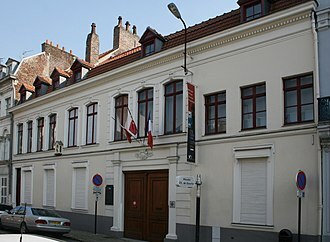 Entrance of the historic building of the ENS, at 45, rue d'Ulm. The inscriptions on the pediment of the monumental doorway display the school's two dates of creation (the first, in the oculus, under the National Convention) and date of installation in this premise. 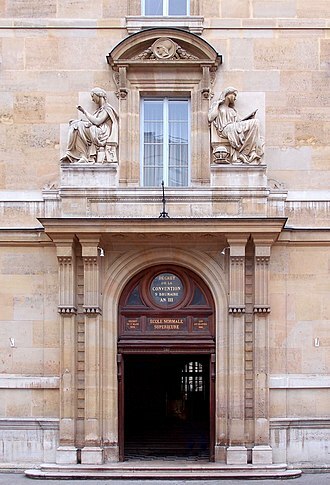 The main entrance to the ENS on Rue d'Ulm. The school moved into its current premises in 1847. The quadrangle at the main ENS building on rue d'Ulm is known as the Cour aux Ernests – the Ernests being the goldfish in the pond. The Scuola Normale Superiore in Pisa, Italy, which was founded as a branch of ENS and retains very close links to it. Senghor signing a copy of his Poèmes, Universita degli Studi di Genova (18 January 1988). The first Salon de la locomotion aérienne, 1909, Grand Palais, Paris. The west (downstream) end of the Île Saint-Louis, seen from the Île de la Cité. West point of Île Saint-Louis and the Pont Louis-Philippe.